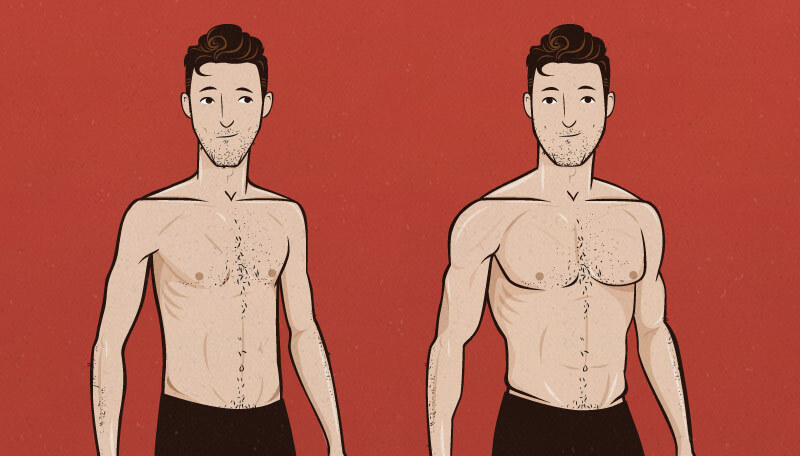 If you want to learn more about why it’s so hard for us to eat enough calories to gain weight, here’s our article on ectomorph stomachs, metabolisms, and appetites. In this article, we’re not going to talk about why it’s hard to eat more, we’re going to talk about how to eat more. To start things off, we need to understand that the fitness industry is focused on overweight people. There are fat-loss tricks hidden in every workout, in every diet, and in every health tip. So the very first step is to make sure that you aren’t accidentally following any fat-loss advice—to make sure that you aren’t shooting yourself in the stomach, so to speak. For example, in most bulking communities, there’s a big emphasis on lifting weights, eating lots of protein, and eating clean. “Clean” is a vague term that can mean a variety of things: avoiding carbs, avoiding sugar, avoiding junk food, avoiding gluten, etc. 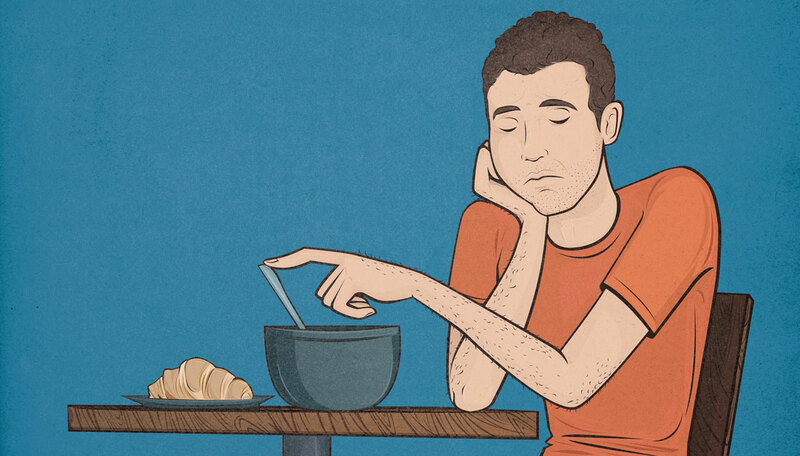 There’s even intermittent fasting, which calls for avoiding breakfast. These are all fat-loss tricks. 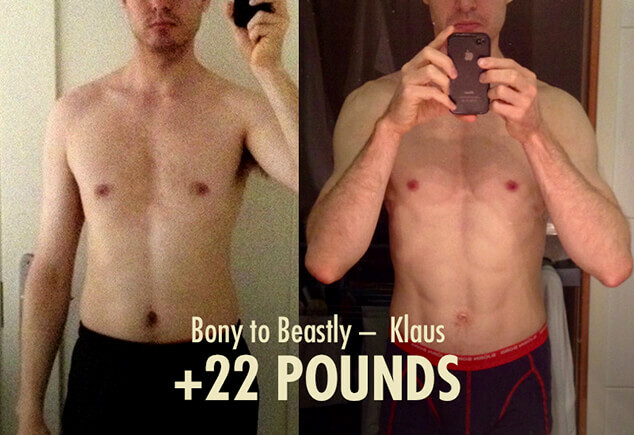 To illustrate this example, let’s consider intermittent fasting for a second. The most popular type of fasting is 16:8 fasting, where you skip breakfast. 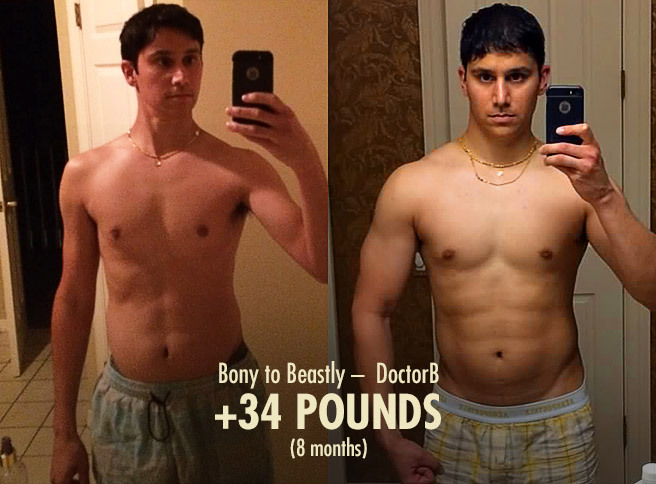 It was popularized by Martin Berkhan, who dubbed it the “LeanGains” approach. Research has proven that intermittent fasting is an effective way to eat fewer calories while still feeling satisfied, making it great for the average guy who’s trying to lose weight. But why is it called LeanGAINS? Why is gains is in the title of the most popular weight loss diet? Because even overweight guys want to be more muscular. 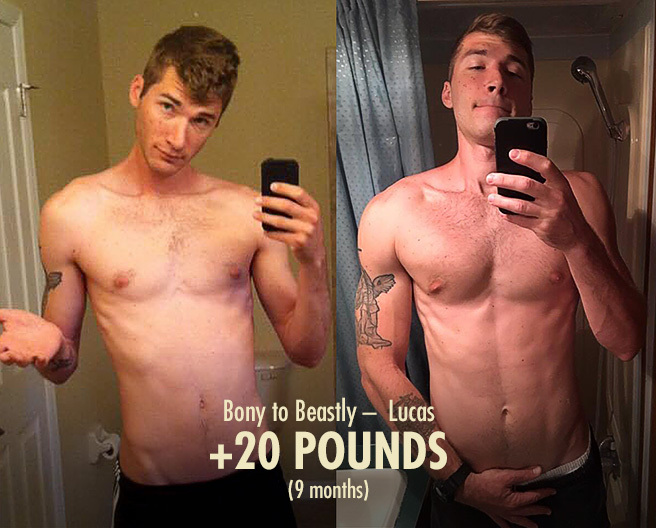 Even in the bulking community, skinny guys are still rare. 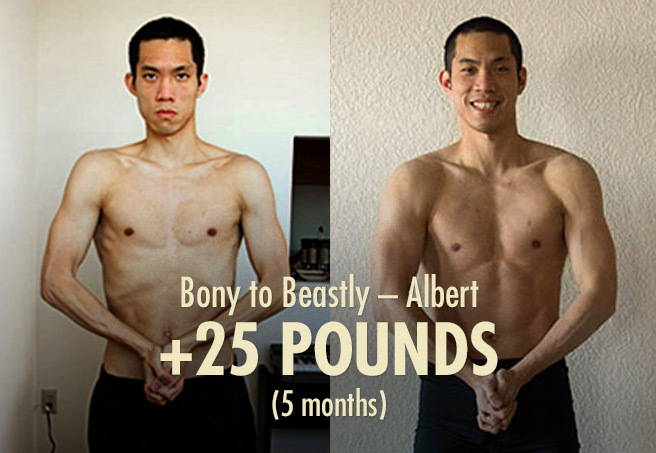 After figuring out how common it was to have a “bulking” diet that’s full of proven ways to help people eat fewer calories, I started to understand why I kept on losing weight whenever I would try to bulk up. These massively popular diets are designed to help the average person build muscle, and the average person eats too many calories. 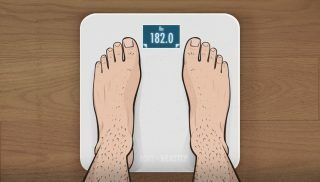 So these diets incorporate appetite reduction techniques to prevent people from gaining weight too quickly as they bulk up. By the way, these approaches are “healthy” in the same sense that losing weight is “healthy.” It’s only true if you’re overweight. There’s nothing inherently unhealthy with breakfast, carbs or even sugar. The only “unhealthy” things about them is that they make it easier to eat more food. Anyway, I obediently followed these diets and I kept on losing weight, totally confused about why bulking diets were making me smaller. 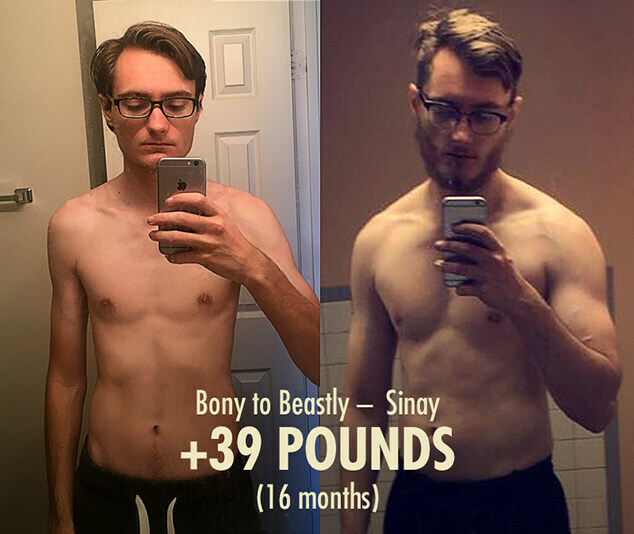 I became frustrated with my genetics, and after a few failed attempts, I came to the (false) conclusion that it was physically impossible for someone like me to bulk up. Thing is, I was asking for directions to Gainsville, and everyone kept giving me directions to Leanopolis instead. No wonder I kept getting lost—those two places are in totally different directions! Now, after successfully gaining 55 pounds, I’m realizing that my failed attempts were simply due to a lack of understanding. As soon as I learned how to eat more calories, I exploded in size. 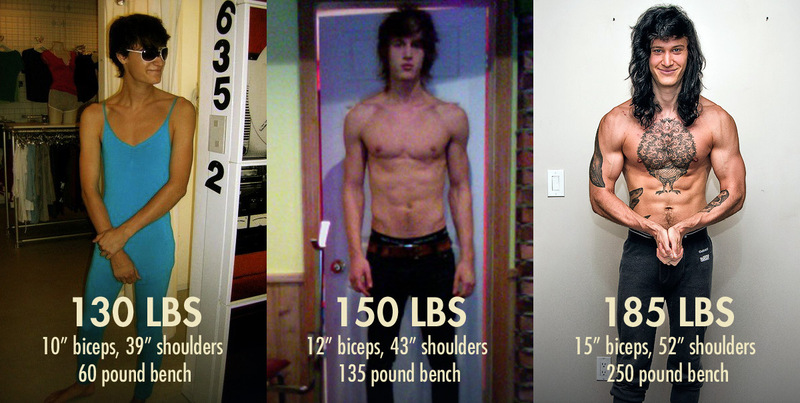 Even as naturally skinny guys, our potential is incredible. I wound up gaining more muscle than I wanted to. And then we helped over 5,000 other guys do the same. Just like overweight people need a “LeanGains” or “clean bulking” approach to building muscle, we need an approach designed for us—for people with smaller stomachs and faster metabolisms who need more calories. How can we make our diets less filling? The calorie density of foods can vary greatly, having a huge impact on how many calories we can fit in our stomachs. When trying to eat more calories, the second thing we want to do is figure out which foods are filling and which ones aren’t. We can use that information to figure out which foods have that magical combination of being good for building muscle and being easy on the appetite. 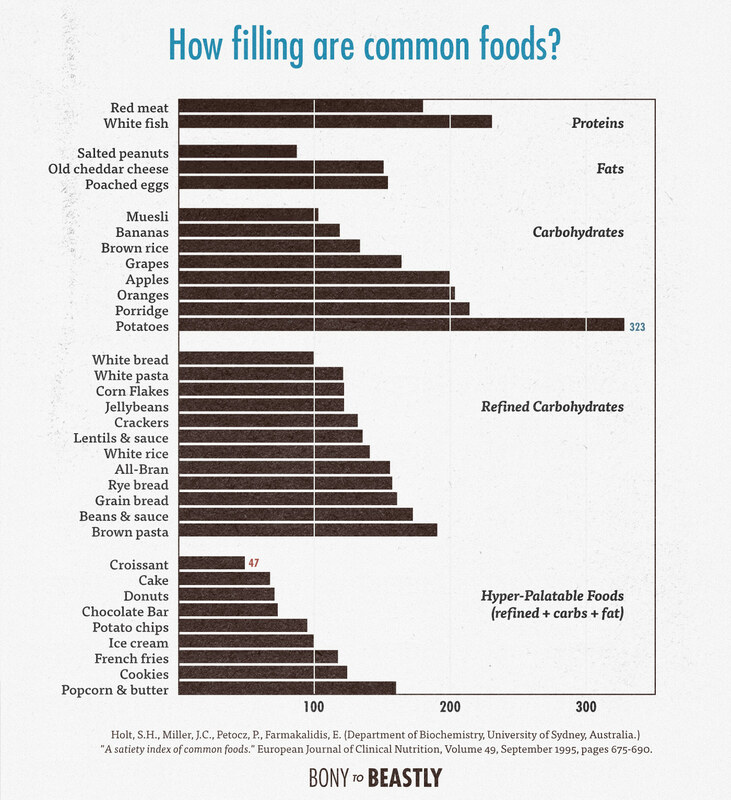 For this, we can use The Satiety Index of Common Foods. In this study, they took the most common foods, figured out how filling they were, and then saw how it affected the study participants’ overall calorie intake. The goal of the study, as you can probably guess, was to help people feel more satisfied while eating fewer calories. We’re going to use it for the opposite purpose: finding out how to eat more calories. Most of this is fairly intuitive. Whole foods are filling, and the more you process them, the less filling they become. By the time we get to pure junk food, we have foods that are very easy to overeat. With the rise of junk foods in modern societies, we also have rising obesity. No huge surprise there. Does satiety actually affect how many calories we eat? The researchers found that with these 250-calorie meals, for every 100-point difference on the satiety scale, there was a corresponding 50-calorie difference in how much was eaten in the next meal. That means that if you ate a potato for lunch (323 satiety) you’d eat a 650-calorie dinner, whereas if you ate a croissant for lunch (47 satiety) you’d eat an 800-calorie dinner. 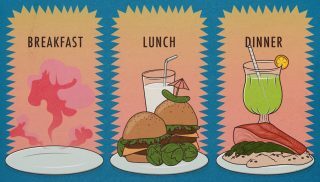 If you eat three meals per day, that could help you eat an extra 450 calories without you even noticing the difference. That’s enough extra calories to gain nearly a pound each week. The researchers concluded that the most filling foods were either high in protein (like chicken breast), high in fibre (like broccoli), or high in water (like potatoes). If we look at research conducted since then, we can also see that chewiness is a huge factor. The harder a food is to chew, the more filling it becomes. And if you don’t need to chew the food (such as when drinking milk), your body barely even realizes that you’re consuming calories at all. Flavour is also an important factor, as explained in books like The Dorito Effect. After all, part of the reason we eat more calories is because we enjoy the flavour of the food. This means that if a meal tastes good enough, we’ll often keep eating even after we feel full. A common example of this is when someone stops eating dinner because they feel full… and then goes on to eat dessert. The opposite is true when a food tastes bland. Since we’re not enjoying the experience of eating the food, we stop eating as soon as our hunger is satisfied. High in protein (like chicken breast). High in fibre (like broccoli). High in water (like potatoes). Hard to chew (like tough steak). Poor flavour (like plain chicken breast). There are plenty of foods that are low in protein, low in fibre, low in water, easy to chew, and intensely flavourful. Doritos, for example. The problem is that Doritos aren’t very good for building muscle. They don’t have enough vitamins and minerals, they’re too low in protein, they’re too low in fibre, they’re too high in processed fat, and they’re bad for our digestive systems if we have too many of them. We need to be smarter about this. How to make protein less filling. If you look at lean fish, steak and chicken breast, you get protein sources that are hard to chew and slow to digest, making them almost impossible to bulk up on. Choose liquid protein sources, such as whey protein shakes, yogurt or milk. Choose high-calorie protein sources, such as salmon or chicken thighs (which have more calories from unprocessed fat). Cook the meat in a way that makes it easier to chew and quicker to digest. One example of this is stewing the meat until it falls apart on your fork. Another example is to choose ground meat instead of steak. How to make fibre less filling. First of all, you don’t need to be eating that much fibre, especially when bulking up. For optimal health, you only need around 10 grams of fibre for every 1,000 calories that you eat. So if you’re bulking up on 3,000 calories per day, you only need about 30 grams of fibre. That’s not very much fibre, and eating more fibre than that can put a real strain on your digestive system, especially when you’re eating so many calories. White foods are okay. For example, brown rice is usually marketed as being healthier because of its higher fibre content. However, white rice is cheaper, less filling, quicker to prepare, easier to digest, and, yes, lower in fibre (which in this case is a good thing). Eat fruits instead of vegetables. Vegetables have a reputation for being healthier than fruits, but fruits and vegetables are actually both equally healthy sources of fibre and phytonutrients. The only “downside” to fruits is that they’re higher in sugar and calories, making it easier to gain weight. You could say that fruits are healthier for underweight people, whereas vegetables are healthier for overweight people. Blend the foods that are higher in fibre. Leafy greens are great for your health. No getting around that. So blend them. They’ll be pulverized into perfectly “chewed” particles that all fit together perfectly, taking up far less space in your stomach and digesting far more quickly. How to make water less filling. It’s important to be drinking enough water, yes, but it’s also important to make sure that you aren’t filling yourself up on water while eating. Soup is notorious for being one of the most filling foods despite being extremely low in calories, but that same effect is true with a lot of foods. If you compare a grape with a raisin, for example, it becomes obvious that 90% of a grape is just water. That’s just as bad as soup! Don’t drink water alongside meals. Have your water between meals instead. If you like having water with meals, try having milk (or soy milk) alongside your meal instead. That way at least you’re boosting your protein and calorie intake. Dried fruits are far less filling than regular fruits. If you take a grape and remove the water, you’re left with a raisin that’s 1/10th the size yet still contains the exact same nutrients and calories. Prunes, dates, and dried mangoes are also great for bulking up. Blend up fruits with yogurt, milk or whey protein. You’ll get all the same nutrients but they’ll be far less filling. Choose ground meat instead of steak. This is the same idea as blending up your fruits, except instead of blending chewy fruit into a smoothie, you’re grinding chewy meat into a hamburger patty or chili. Cook your food well. Cooked carrots are easier to chew than raw carrots, (properly) stewed beef is easier to chew than steak, and kale chips are easier to eat than a kale salad. Cooking is also a form of healthy processing that will help your body digest the food more easily and extract more calories from it. How to make food taste better. When we eat bland foods, we tend to get bored of them quickly, and as soon as we’re full, we stop eating. 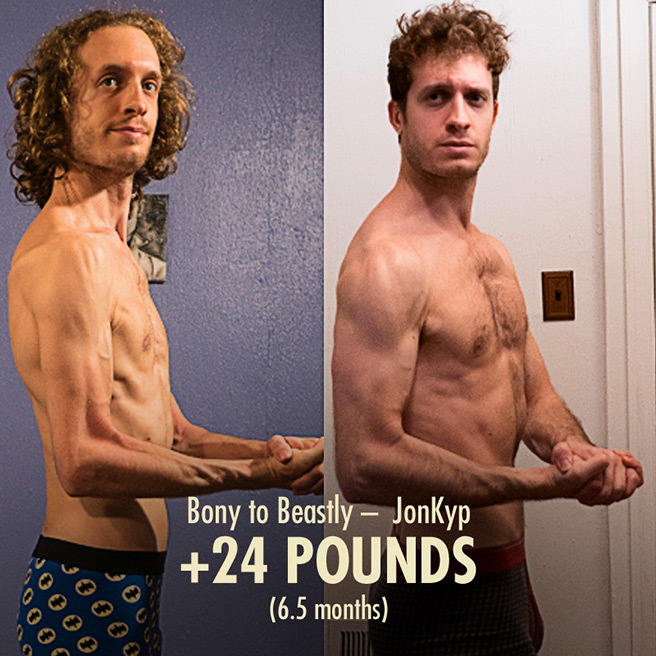 This makes it psychologically harder to eat more calories, and honesty, making this bulking up process more psychologically enjoyable is one of the best ways to guarantee that you’ll stick with it long enough to see real results. Use sauces and spices liberally. There’s nothing wrong with using plenty of barbecue sauce, ketchup, mustard, hot sauce, soy sauce, salt, pepper, onion powder, garlic powder, and whatever else you enjoy using on your foods. Some of them contain calories (often coming from sugar), but that just boosts the calorie content of your food without removing any of the vitamins, minerals and fibre in it. Vary the flavours in your food. It’s easiest to bulk up when your meals are fairly consistent, but your body will burn out on certain flavours if you eat them over and over again. So try to add variety via spices, sauces and toppings. For example, my wife and I will have picadillo served on tortillas one day (as tacos) with plenty of hot sauce, then picadillo served on a bed of rice the next day with a little bit of soy sauce (which tastes better than it sounds). This allows us to make a giant pot of picadillo that we eat all week long without feeling like we’re eating the same thing every day. Combine smaller meals into one mega-meal. Tim Ferriss famously bulked up on chili served on a bed of macaroni and cheese. A bizarre combination, but one that helped him prevent flavour fatigue. A more common example of this would be to have dinner (e.g. stew) served alongside a drink (e.g. milk) followed by a dessert (e.g. dark chocolate). Yes, these larger meals will take a while to digest, but if you have them at night, your body can digest them while you sleep. Takeaway: now’s not the time to be loading up on raw low-calorie watery fibrous foods like broccoli, lettuce, and watermelon. Go for the higher calorie choices instead, such as hamburgers, bananas, milk and trail mix. They’re just as healthy but far less filling. Dirty bulking often makes people feel soft and swollen, whereas “clean” bulking is packed full of so many fat-loss tricks that it makes it almost impossible to eat enough calories. The trick is to bulk up on nutritious foods in a way that makes you feel healthier and look handsomer. Mark Schatzker, author of The Dorito Effect, wrote about how the 60’s changed the food industry in two key ways. First, scientists found a way to make artificial flavouring taste better. Instead of craving cheese, people started craving cheese-flavoured Dorito chips. Doritos have the same great cheese flavour except even more intense. Second, farms were starting to master the art of growing greater volumes of food. Their focus on volume instead of flavour was excellent for feeding tons of people at reasonable prices… but farmed foods began tasting more bland. The thought of eating a bowl of berries became far less exciting, and people became more likely to choose berry-flavoured junk food instead. Making your diet more delicious is a great way to make bulking easier and more enjoyable, and choosing junk foods instead of whole foods is an effective way to do that. Moreover, most junk food is low in protein, low in fibre, low in water and easy to chew, making it extremely easy on your appetite. And most junk food is also so incredibly processed that it’s essentially predigested, allowing you to absorb the calories extremely efficiently. Junk food makes eating enough calories to gain weight far easier. These are huge points in favour of dirty bulking, right? Maybe it’s not the healthiest approach, sure, but if you’re desperate to eat more calories, it will work… right? Sort of. It will absolutely help you eat more calories, especially in the short term, but you’ll also start running into a few problems. You’ll start getting vitamin and mineral deficiencies, which will limit your testosterone production and crush your immune system, among other things. You’ll start gaining more fat and less muscle, and you’ll start getting sick more often. You’ll develop a weaker digestive system. Your digestive system relies on healthy bacteria to help you digest your food, and these healthy bacteria survive on fibre and prebiotics, which most junk food is too low in. Dirty bulking can lead you to a point where you feel like you can’t digest food properly anymore. You’ll wear your body down. Lifting weights stresses your body and forces it to adapt. It’s a good stress, but if you’re also eating too much junk food, you’re going to wind up inflamed, fatigued and unable to recover in time for your next workout. You’ll be consuming too much dietary fat. You’ll build muscle the most leanly when you eat a diet that’s very high in carbohydrates (50–60%), moderately high in protein (20–30%), and fairly low in fat (20–30%). Junk food tends to be too high in fat, and that extra fat is very easily stored as body fat. To make matters worse, the type of highly processed fat that’s commonly used in junk food is even more likely to be stored as body fat. So should we bulk “dirty” by eating a diet that’s high in junk food? Probably not. At a certain point, you’ll probably get sick, feel bad about how you’re looking and feeling, and give up. But keep in mind that the best bulking diets don’t focus on cutting the bad stuff out, they focus on adding the good stuff in. A good bulking diet isn’t about eating clean, as eating clean emphasizes restricting bad foods. A good bulking diet is about focusing on eating plenty of nutritious foods. If there’s some junk food in there too, so be it—it’s probably making it easier to eat enough calories. So the best way to improve your diet as an underweight guy is to add in more of the protein, fibre, starchy carbs, vitamins, and minerals that you’re missing, not to remove the easy sources of calories that you’re already in the habit of eating. Start having a glass of milk alongside your meals to boost protein. Start adding some sliced bananas into your breakfast cereal for added prebiotics. Snack on some trail mix between meals to add vitamins and minerals. Once gaining weight becomes easy, then you can work on swapping out your unhealthy meals for healthier alternatives. And as you swap in those healthier meals, keep in mind that you want to be keeping those new foods as easy on your appetite as possible. For example, let’s say you love eating fast-food hamburgers. There are a lot of appetite tricks in there. The meat is ground, the bread is heavily processed, the processed cheese is calorically dense, and there are a lot of delicious sauces in there. If you swap that hamburger for some steak and veggies, you’ll be eating far fewer calories and feeling far more full afterwards. That’s a bad swap. So when you’re trying to eat more calories, a better replacement for your burger would be a big bowl of deliciously flavoured chili with a generous topping of cheese. The chili is even easier to chew than a hamburger patty, it’s even more calorically dense, and it’s even more convenient to make (because you can cook 14 servings at once and reheat them in a few minutes, saving yourself from two entire weeks of having to cook dinner—far more convenient than fast food). This makes your meal healthier without sabotaging your efforts to eat more calories. Also, don’t strive for perfection. If 80% of your diet is whole foods, that’s usually enough to give you all the protein, fibre, prebiotics, vitamins and minerals that you need for perfect health and perfect gains. Takeaway: Focus on adding nutritious foods in, not on removing junk food. 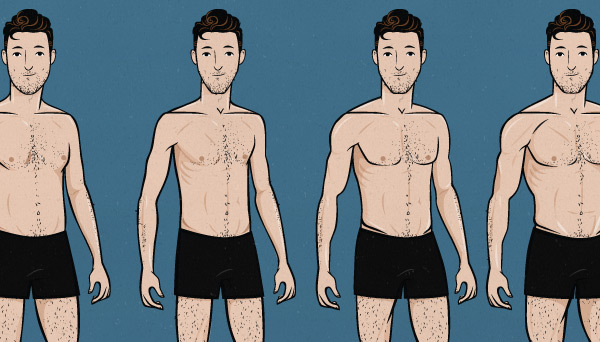 One of the main differences between naturally skinny guys (ectomorphs) and naturally overweight guys (endomorphs) is that our stomach sizes are totally different sizes. 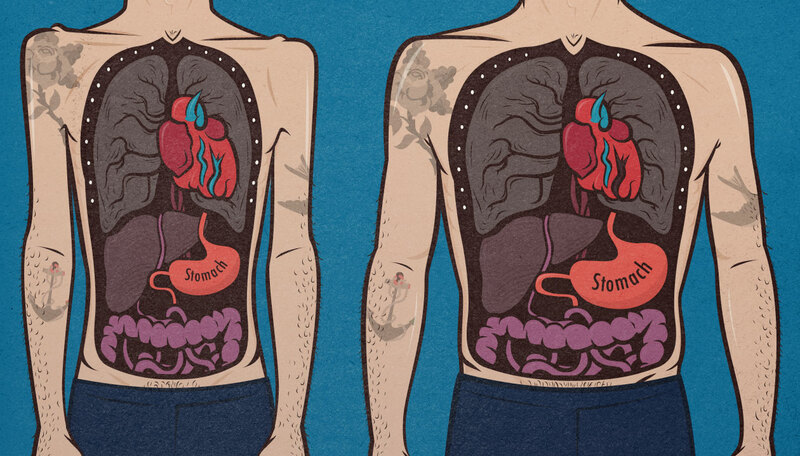 In fact, our stomachs can be up to 6 times smaller than theirs. This is why they can wolf down giant meals with ease, but if we try to match them fork for fork, we wind up feeling sick and lethargic. However, our digestive system is often similarly powerful to theirs, especially once we get used to eating more food. This means that we can process roughly the same amount of food each day, it’s just that we can’t fit as much in our stomach per sitting. So one of the best ways to get around a small stomach is to forget about eating bigger meals and instead focus on snacking between meals. You only need about 500 extra calories in your daily diet in order to gain a pound each week, and that can easily be accomplished with just two 250-calorie snacks each day. If we look at the research on how snacking affects appetite, your body does a poor job of tracking how many calories you eat while snacking. If you have a 300-calorie snack after lunch, you’ll naturally eat around 100 fewer calories for dinner. That means that you’ve added 200 calories into your diet without having to stress your appetite or stomach whatsoever. There’s another factor to consider as well. Every time you eat a meal that has enough protein in it (about 20 grams), you’ll stimulate muscle growth. This extra muscle growth will last for a few hours, and then your body will return to normal, at which point you can stimulate muscle growth again by eating another protein-rich meal. The researcher Dr Eric Helms estimates that eating 4–5 meals per day, each containing at least 20 grams of protein, is the absolute ideal for building muscle. This schedule is also well-suited for guys with smaller stomachs, as eating more frequently means that your meals can be smaller. However, be warned that frequently eating protein-rich meals can make it harder to eat more calories. Protein is the most filling macronutrient, so if you’re finding that too difficult, you might find it easier to snack on lower-protein foods like trail mix. Takeaway: if you currently eat the standard three meals per day, instead of making those meals bigger, you might want to experiment with adding in an extra 500-calorie meal, or adding in two extra 250-calorie snacks. If you focus on healthy calorically dense foods, it will be far easier to eat more calories. Whole milk is high in protein and calcium, making it great for stimulating muscle growth. It’s easy on the appetite because it’s a liquid, making it harder for our bodies to detect the calories, and making it pass through our digestive system more quickly. Dried fruits are a fraction the size of regular fruits, yet they have just as many vitamins, minerals and fibre. In fact, if you compare dried fruit against fresh fruit by weight, dried fruit contains about 3.5 times the amount of fibre, vitamins and minerals as fresh fruit. Trail mix is a blend of the highest calorie health foods: dried fruits, nuts and chocolate. This gives you the carbs, fibre and phytonutrients from the dried fruits while also getting the healthy fats and minerals from the nuts and chocolate. Bananas are one of the most calorically dense fruits, and they’re also a great source of prebiotics, which is important for keeping your digestive system running smoothly. They also taste great in smoothies, can be sliced up and added to cereal, and make a great pre-workout snack (especially if you lift first thing in the morning). Kefir can be made by fermenting milk. The fermentation process eats up some of the sugars in the milk, leaving probiotics in its place. This makes kefir higher in protein than milk, and richer in probiotics than yogurt. Meat is often chewy and sinuous, making it quite filling and slow to digest. It’s common for guys who are trying to eat more calories to add more steak into their diet, as steak is so high in protein. However, if you choose ground meat instead, not only is it often cheaper, but it will also be far less filling and digest far more quickly. Don’t eat a restrictive diet. Don’t focus on cutting out sugar, carbs, beer, gluten, junk food, breakfast—whatever. Restricting your diet is a mindset designed to help people lose weight. To gain weight, we need to stop focusing on cutting bad things out, and start focusing on adding good things in. Eat more often. If you have a small stomach, eating bigger meals will be hard. Snacking is a much easier way to add calories into your diet. Eat denser foods. For example, if a raisin is 1/10th the size of a grape, then you can fit 10x as many calories in your stomach if you eat raisins instead of grapes. Drink your calories instead of eating them. Liquid calories are less filling per calorie and clear out your stomach more quickly. For example, have a whey protein shake instead of a chicken breast. Prepare your food for easy digestion. The better you can prepare your food, the less work your digestive system will have to do. For example, ground meat has essentially been pre-chewed, making it far easier to eat and digest. Build a stronger digestive system. Eating plenty of prebiotics and probiotics can improve your ability to digest food. For example, a diet rich in onions, garlic, bananas, yogurt, and hard cheeses will make it easier to eat more in the longer term. Make your food taste better. The better your food tastes, the more of it you’ll want to eat. One way to build this into your diet is to have (somewhat) healthy desserts after dinner. Also, use plenty of sauces and spices. When we asked our 10,000 newsletter subscribers what their biggest issue was, 60% of guys told us that they had trouble eating enough. Their metabolisms were too fast, their stomachs were too small, their appetites were too fickle, and even though they tried to force-feed themselves, they just felt sick and tired. 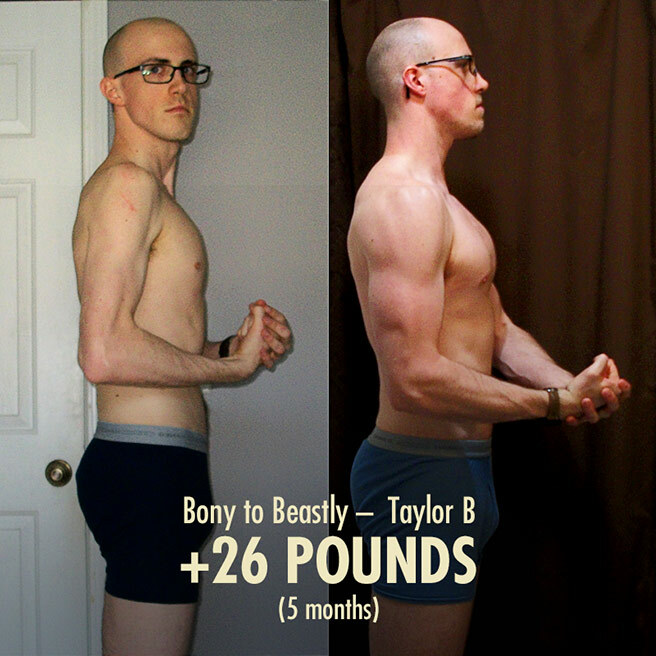 After 10 years of research, personally gaining 55 pounds, helping my closest friends bulk up, and then helping over 5,000 guys build muscle with the Bony to Beastly Program, I can tell you that it’s possible eat enough calories to gain weight, and it doesn’t need to be nearly as hard as you think it does. 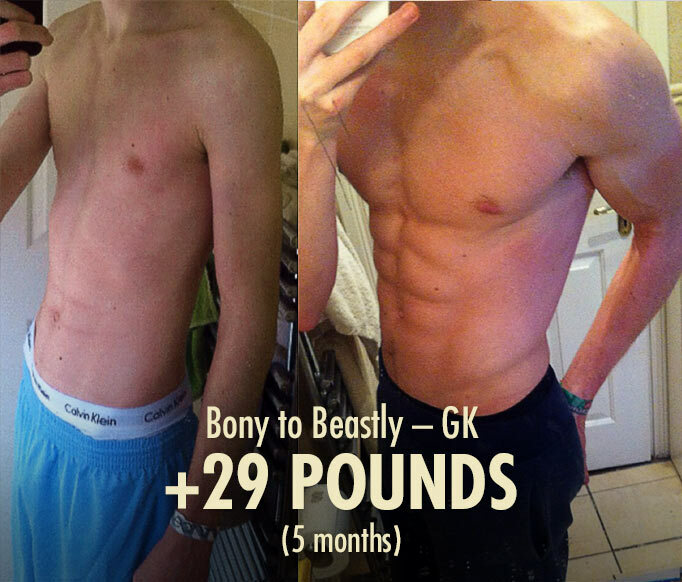 Gaining weight isn’t just possible, it’s realistically achievable. Three months from now, you can step onto the scale 20 pounds heavier. I’m not just pulling that number out of my biceps, either. Not only have I done it three times myself (I gained 55 pounds by doing three 3-month 20-pound bulks), but this is what I spend all day helping guys do in the Beastly community. The trick is being clever about it instead of trying to brute-force it. Now isn’t a time to watch a motivational video and use will yourself to eat more. If you do that, you’ll be able to tough it out for a few miserable weeks if you’re lucky, and then you’ll burn out and give up. Now is the time to start learning about how to eat in a way that suits your body type and your goals. 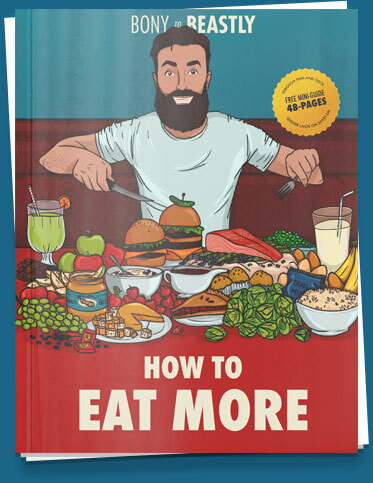 So, up above we’ve explained how appetite and stomach capacity work, along with a number of ways to eat more calories. But just to make sure you have an actual action plan, we’ve made a guide for you. It includes a sample meal plan with all of these principles optimized (which is how I was able to finally gain 55 pounds). We’ve also included 3 bulking recipes: one for breakfast, lunch and dinner. Is appetite also psychological? 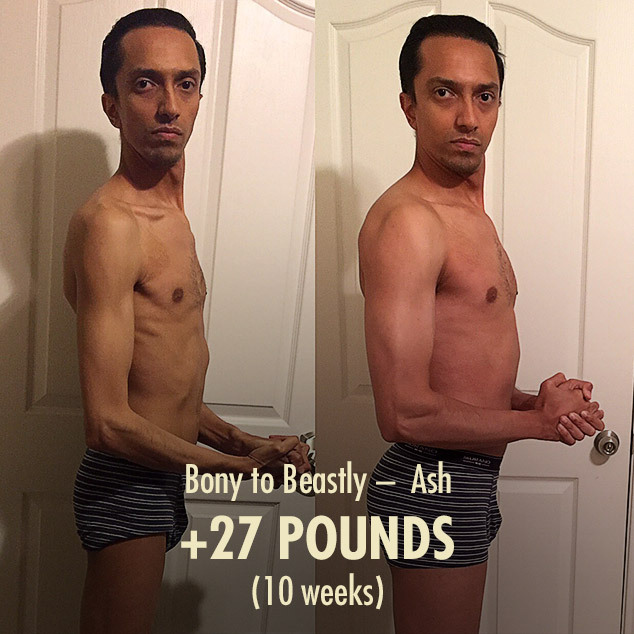 Being ectomorph, I likely have a small stomach, but I love to eat, I could easily down 6000 calories of protein and fiber. It would get me fat, as it has twice in the past! Even while lean bulking I really have to control myself to not overeat. Hey Cole, appetite can definitely be psychological. One example of that is our desire to eat more calories when the food tastes good. Not all ectomorphs have small stomachs, though. Sounds like you’ve actually got quite a large one. If you’re eating a surplus of calories and still not feeling even satisfied, then that makes it sound like you’ve got a VERY large stomach. You might have other ectomorph traits, but I’d guess you don’t have this one! how do i email or contact u guys i have a few questions. like if i want to do sports but i still want gain mass (im 16). 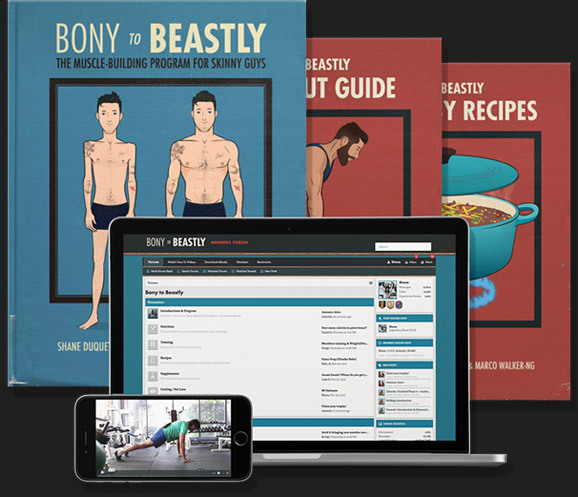 And, of course, you can always email us@bonytobeastly.com. I hope you decide to join the program, man! Isn’t true that high processed foods (white bread, rice, etc) trigger a spike in insuline levels which could be terrible mid-long term? Is that something we should worry? on the same subject, would be okay to eat, for exemple, 3 bananas (only carb) for a meal, considering that they are easyly digested by themselfs, or we should again worry with the insulin spikes? Anyway, thanks for the article, really appreciate your work. Hey Rafael, those are good questions. It’s true that carbs are more insulinogenic than fat. So, for example, rice will indeed cause bigger insulin spikes than butter. Protein is also quite insulinogenic, mind you, so having a whey protein shake will also trigger a hearty rise in insulin. Whether that’s good or bad depends on where the insulin is carrying those calories. If the insulin is storing it in your fat cells, then yes, that would be bad in the long term, especially if you’re overweight. However, the whole point of bulking up is to get the insulin to help you store the extra energy as muscle. And more muscle is fantastic for your longterm health. 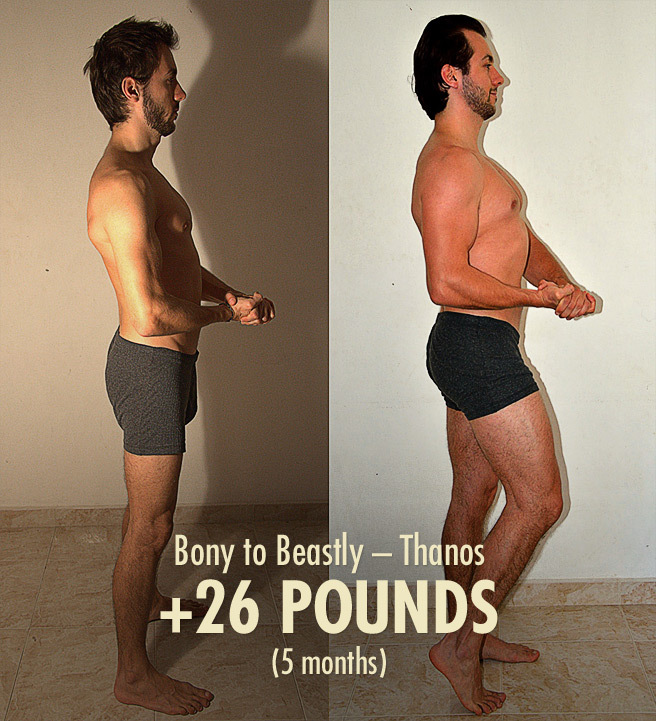 If you’re lifting weights, sleeping well, and eating a diet that’s made up mostly of whole foods, some bread and rice and whatnot shouldn’t be a problem, especially if you bulk up fairly leanly—and you should indeed definitely bulk up leanly. Always a good idea to clear these diet changes with your doctor, though. Is it okay to eat three bananas as a meal? Something like trail mix would be better. Or a banana and a pint of milk. Those would also make it really easy to consume more calories, they’d also digest easily, they’d give you a wider variety of nutrients, and would include some protein. I don’t really see a big issue with eating three bananas, though. IF has a lot of positive effects hormonally which are great for gains. It brings down insulin while naturally boosting GH and Testosterone. This causes the body to burn the fat store during the long window of fasting which can help get rid of the skinny fat while the muscle mass only increases due to the increased GH and T levels when combined with lifting. And if you do IF, your appetite becomes so great that you end up eating the same amount of calories in an 8 hour window. So IF is really about fat loss and muscle gain (hence called LeanGains) which all body types including us skinny guys can only benefit from. Hey RR, I disagree. 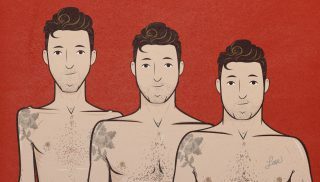 First of all, I want to point out that this article is written for guys who are struggling with bulking diets, and who are trying to eat more calories. Many of these guys have naturally smaller stomachs, faster metabolisms, and appetites that don’t respond as expected. With that in mind, yes, you’re going to be more hungry when you finish your fast, but your stomach isn’t going to be any bigger. For guys with naturally big stomachs, this isn’t an issue, but if someone struggles to eat a 1,000-calorie dinner, then having to eat a 2,000-calorie dinner because they skipped breakfast is a nightmare. Not only are they going to feel awful, but they’re at risk for developing issues like acid reflux (as I did when I tried to bulk using while using a LeanGains approach). 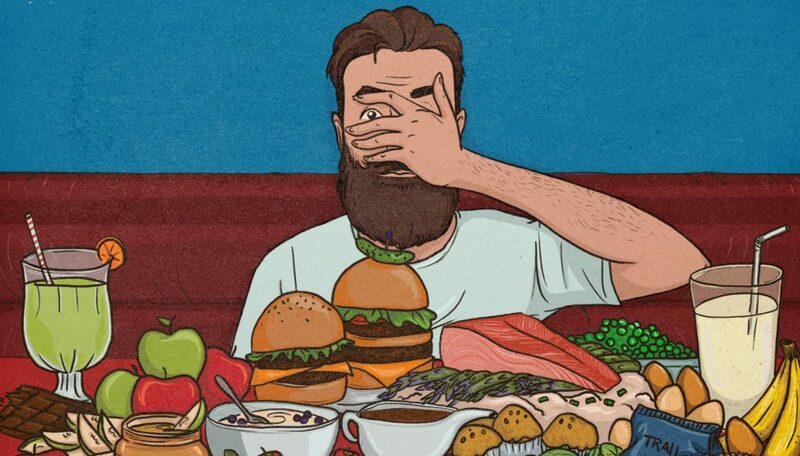 Now, this article is for guys who are trying to find a way to eat more calories, but let’s say you have a big stomach and you enjoy intermittent fasting while bulking. 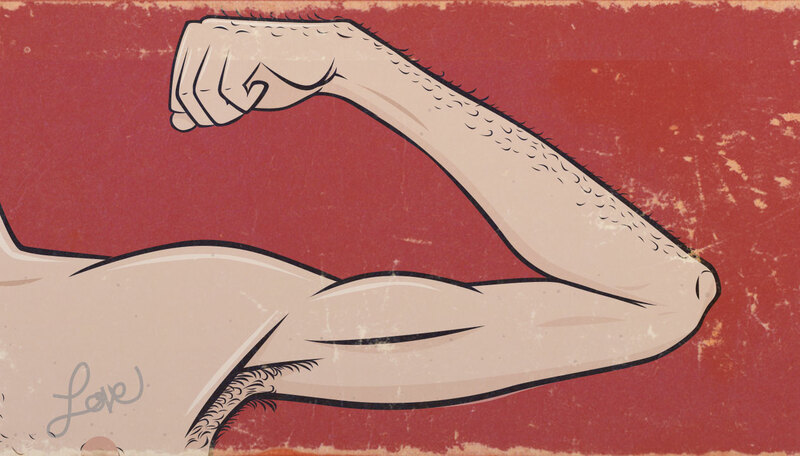 Would you get any muscle-building advantages due to testosterone or growth hormone? Yeah, sure, but you’d also be facing muscle-building disadvantages. For one example, you miss an opportunity to stimulate muscle growth by eating a protein-rich breakfast and you thus spend less time each day in a calorie surplus. And keep in mind that being in a calorie surplus is WAY more anabolic than the acute increases in growth hormone and testosterone caused by intermittent fasting. I don’t want to make this sound like a big deal. Most of the muscle-building nutrition researchers, such as Dr Eric Helms, Dr John Berardi and Dr Layne Norton, agree that 4–5 meals per day is ideal for muscle growth. However, you can still build muscle just fine while intermittent fasting, just like you can build muscle just fine while eating 8 times per day. This is relatively minor stuff here. The main point I’m trying to make is that intermittent fasting makes it harder to eat enough calories, not that it’s bad for building muscle. Appreciate your long response, Shane. However there is a lot of conventional science quoted here that are getting debunked now. This idea of eating 5 meals a day throughout the day keeps the insulin level spiked up all the time that has all kinds of negative effects in the long term. Fasting in addition to increasing growth hormone and testosterone also results in building up body’s immunity (which prevents down times that are terrible for builders), improves digestion (which results in processing more food easily during the eating window), reduces triglycerides, slows aging and so many other benefits. “One common myth is that fasting will lead to loss of muscle mass. The book clearly describes the process of protein catabolism, explaining how your body actually downregulates protein catabolism and upregulates growth hormones in response to fasting. “If you follow the biochemistry, your body stores energy as glycogen in the liver, which is links or chains of sugar, and then it stores [it as] body fat. During fasting, you start by burning off all the glycogen in the liver, which is all the sugar. There’s a point there where some of the excess amino acids in your body need to get burnt as well. I’m not debating that there are benefits, just that you have to compare those benefits against the opportunity cost, i.e., eating a more traditional diet also comes with many benefits. Regarding insulin, no. If you’re eating 5 meals per day you’d have a series of smaller spikes throughout the day. If you skip breakfast you’d have larger spikes at lunch and dinner. You don’t wind up with chronically elevated insulin in either case. And that’s not really an issue that naturally skinny guys need to worry about anyway. Being lean raises insulin sensitivity, lifting weights raises insulin sensitivity, and building muscle raises insulin sensitivity. Again, this is an issue for overweight people that’s being generalized as if it applies to us equally. It doesn’t. In this case, we have separate issues. Now, I totally agree with you (and Dr Jason Fung—what he’s saying lines up with the research I’ve read) that muscle loss isn’t a risk when intermittent fasting. I’d add that it’s a great way to reduce calorie intake in an enjoyable way. This makes it great for cutting. No argument there. However, that has nothing to do with bulking. Bulking programs aren’t designed to minimize muscle loss, they’re designed to maximize muscle gain. Intermittent fasting isn’t optimal for muscle gain. Moreover, this article is about how to eat more calories, and the main concern with intermittent fasting is that it makes it WAY harder to eat more calories. After all, the main reason intermittent fasting is so popular is that people find it helps them eat fewer calories without feeling as hungry. One thing that’s been helping me bulk recently has been learning to bake. Like the other week I made a batch of chocolate chip cookies. I did the math and I ended up with about 30 cookies at 215 calories each. Of course they taste better than the prepackaged store-bought version. All for a few buck’s worth of ingredients. I froze them and take a couple out at a time. I know better than to base my whole diet on cookies, but they taste good and go down easy, so eating even one a day is a super-simple way to get in a couple hundred extra calories. Oo, I love that tip! Cheap, fun, delicious, convenient. Plus, homemade cookies not only taste better than store-bought ones, they also tend to have better quality ingredients. (They’ll often include eggs, dark chocolate, oatmeal, butter instead of palm oil, etc.) And they taste great with milk, which will bring the protein. Yeah, plus at this point I’m just trying a bunch of different recipes for the learning experience; doing what seems interesting or tasty. I’m sure if I wanted to I could make some sort of optimized bulking cookie with lots of walnuts or peanut butter or whatnot to boost the protein and calories even higher. You can even get protein powders specifically designed to be used in baking. That can be fun to experiment with, but even just veering more towards higher quality ingredients (peanut butter, butter, oats, dried fruits, nuts, etc) should do the trick. And even then, yeah, not every cookie needs to be a health food or protein bar. Sometimes a delicious cookie can just be a delicious cookie. I always read about “Trail mix” but never googled it. I mean it made sense to me it is something like dried fruits you take on a hike and munch on it along the way. Finally I know what it is. 1.] Don’t drink water alongside meals. 2.] You might not need to drink as much water as you think. I can tell when I am thirsty, obviously, I go to drink but I have hard time tracking water in meals / fruits, you name it. The app I use does not take this into account at all. I know well how much drinking healthy regular amount of water on daily basis during the day is beneficial but I really have to focus on this. It is one of those things I yet did not overcome oever the years and I drink well or enough only during focused bulk periods, be it one, two or three months. Once that is done I go back to my old silly me, not drinking enough. The question is how to tell how much I need. I know, headache, dark pee colour are all bad signs, but it is as if I feel thirsty every damn time only when it is late. Glad you dug it, Daniel! 2. Try starting the day off with a big glass of water as soon as you wake up. You could also add in a glass of water halfway between meals. If having water between meals sounds too boring or is too difficult to remember, you can always have some tea (or other flavoured beverage) instead. PS your comment got auto-flagged as spam because of the embedded links of the typos, which I’ve removed and fixed (Thank you!). If you don’t see your comment show up right after posting it, that’s what’s happened. In general I know I need to drink more water. I feel better when I drink more than “usual ” amount (which is not enough). I will try to unlearn this habit of drinking during meals. I already drink “extra” glass in the morning and also in the evening. So 500 kcal more a day is enough? Can you recommend a calorie calculator to count your maintenance calories? The most effective way to figure out your maintenance calories is to track how many calories you eat for a few days. Metabolism and activity levels can vary quite a bit. If you want a rough idea, though, My Fitness Pal tends to have good algorithms. Just be ready to adjust based on how much weight you gain. Certified personal trainer with my own business and gym here; this site is a friggin’ goldmine of information! 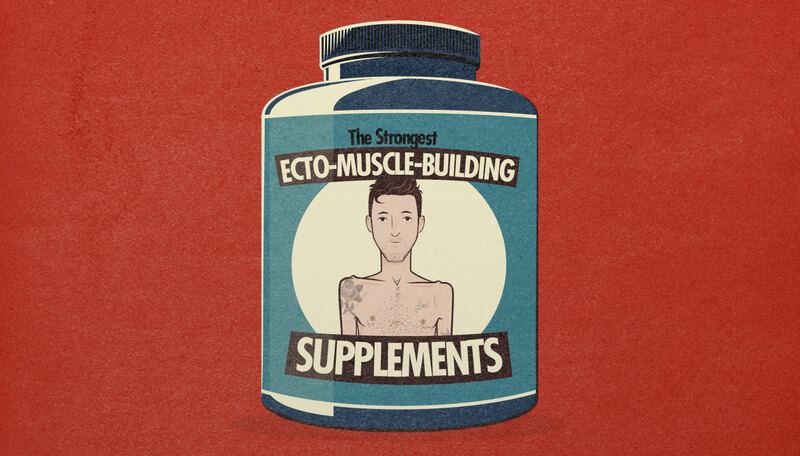 I’ve been ecto my entire life, and managed to put on weight on my own with the majority of the info here (before even finding it here; years of intense full-time effort), and it pleases me to see someone putting this info out there! I got myself from 139 to 165 over the course of 5 or so years, and I’m still climbing. None of the books for certification (ISSA here) talk about gaining weight in a realistic fashion for us furnace types. 97% of my clients are looking to lose weight, and you’re so spot on about the industry being geared toward them. It’s insidious. Thank you for making this information available, corroborating my research, and supporting the theory of NEAT calorie burning via all the damn fidgeting, walking, feet tapping, nail biting (and in my off time) yo-yoing we do! Keep up the good work, Shane and team; the eBook is stellar! 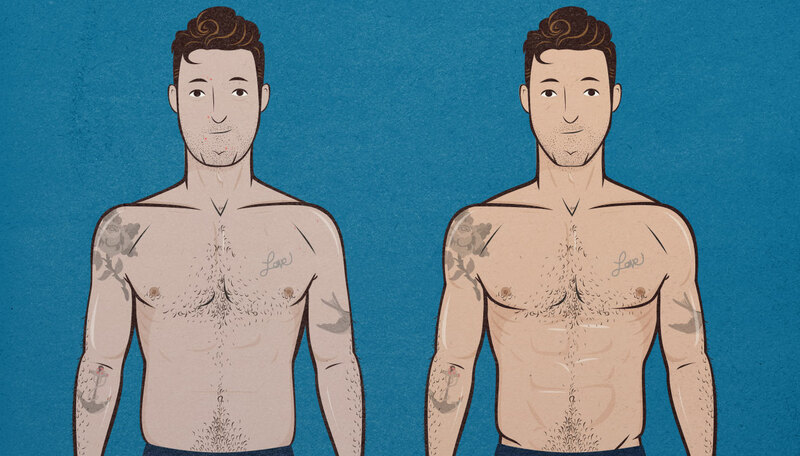 So crazy how personal trainers aren’t even trained to deal with our body type. I mean, yeah, it makes sense—it’s rare—but you’d think it would still be part of the mandatory training. Thanks again for the comment, glad you dug the eBook, and keep it up, man! I cannot drink milk, is it bad to drink 1 liter of fresh orange juice to get more calories (getting proteins is not the problem only calories)? Yeah, getting more protein in your meals and then having orange juice on the side is similar to having more carbs in your meal and then having milk on the side. I don’t see a problem with that. Just make sure that your meals have plenty of fibre and unprocessed foods so that the (natural) sugar in the orange juice doesn’t all hit you at once. Shane my man I just want to say i think it’s great what you guys are doing! 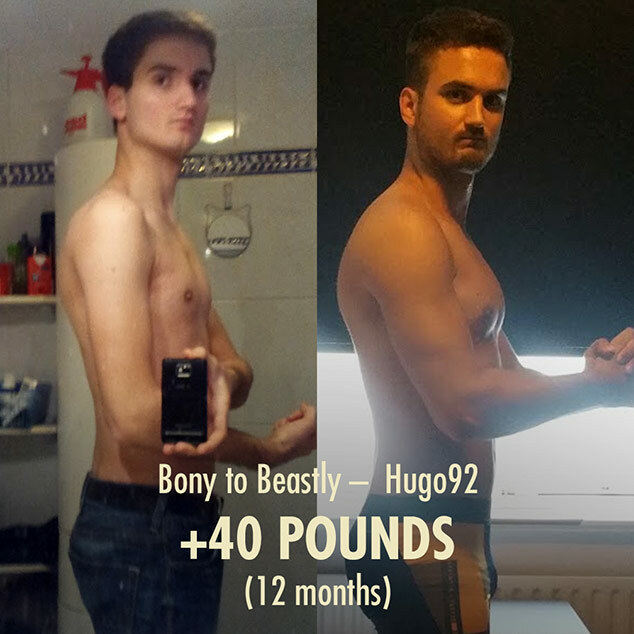 Skinny guy here from the UK, 6’2″ 145lbs, platued and haven’t gained anything in 2018. Appetite affected from a history of anxiety issues, over that now though. Working my darned hardest to put on another 30-40lbs, incredibly difficult! Good luck gaining those next 30–40 pounds. Difficult for sure, but also totally realistic, and once you succeed, it should be really easy to maintain those gains. Buenos. Yo soy de puerto rico y ahora in inglés oieste..
Hey Bopper, greetings from Canada. Thx for this article Shane. It´s very important to realize there are other ppl struggling out there! Force feeding doesnt mean overfeeding! Which means you eat more than your stomach is capable of. So did I – eating when I was full, without apetite, just to hit 3500cals/day – and then, after about an half a year I ended up with terrible Git problems(stomach pain, acid reflux, and other pleasant symptoms) which almost destroyed me (not literally) and is still chasing me- even after almost year. But w/e I was doin it for muscles, I wanted them so much. My friend was motivating me that my body will get used to it. But it didnt somehow I am in the category of small fragile stomachs, sup! Now I am better but still got problems with acid reflux -always had since teenage. But still was able to gain 8kgs in about year – which is like fckim miracle with my stomach. At least least without fat, because what the heck is fat? Mirin a bit. Doctors advise to my stomach issues? Eat less. Ecto requirements? Eat more. Fck genetics, fck life. I will make it. You will make it too, just be careful guys. Sry, had to share it and here it is on its place. I hope it helps somebody avoid similar problems. You do great job Shane with these articles. You help ppl and thats just great today. Written on phone, excuse typos and form pls. 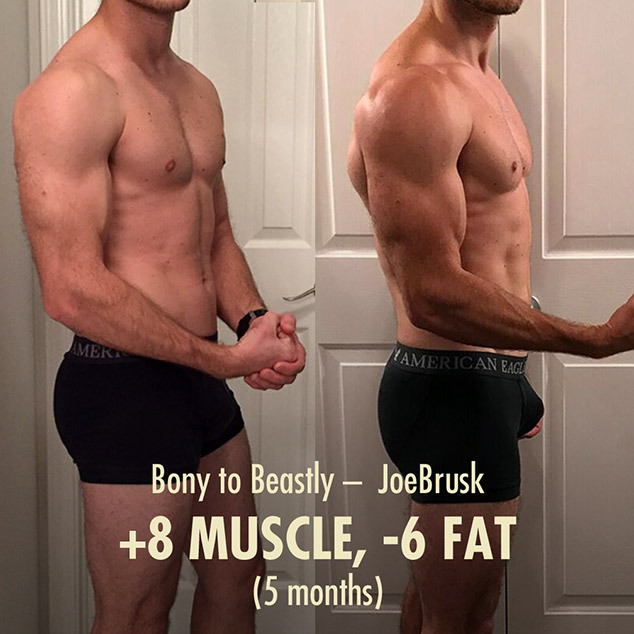 I’m sure you’ve answered this in previous threads, but if it’s scientifically impossible to gain more than 2 lbs of muscle per month, how can you advertise 20 pounds of muscle in 90 days? I understand that some of that will be water, bone density, and fat, is that true? 90 days divided by 7 days in a week = 12.85 weeks. 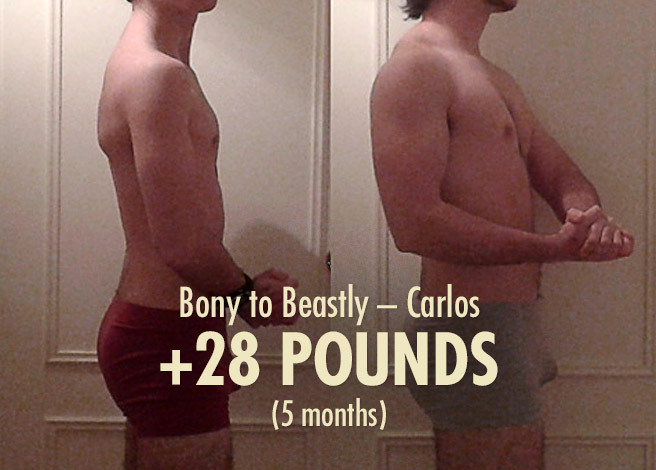 2 pounds per week multiplied by 12.85 = 25.7 pounds. 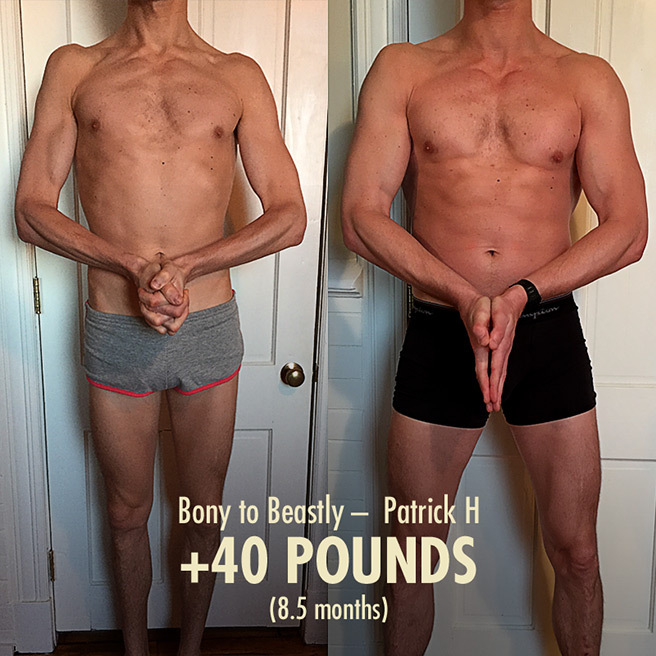 I’ll also add that we do get some members who are clinically underweight in terms of BMI, like Shane and I both were when starting out, who can gain an upward of 8 pounds in their first week. Those people can and have gained even more in that time period because their body is literally starving for that extra nutrition. We all have different starting points though. 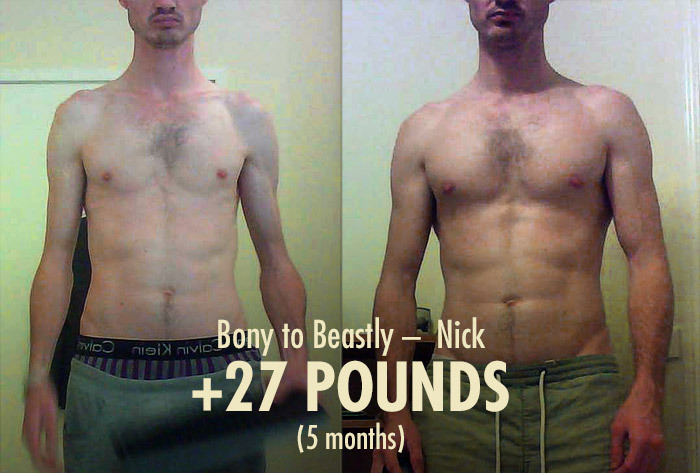 Someone who has been lifting for a number of years and has already gained an appreciable amount of muscle definitely shouldn’t be gaining as rapidly as a skinny guy could. 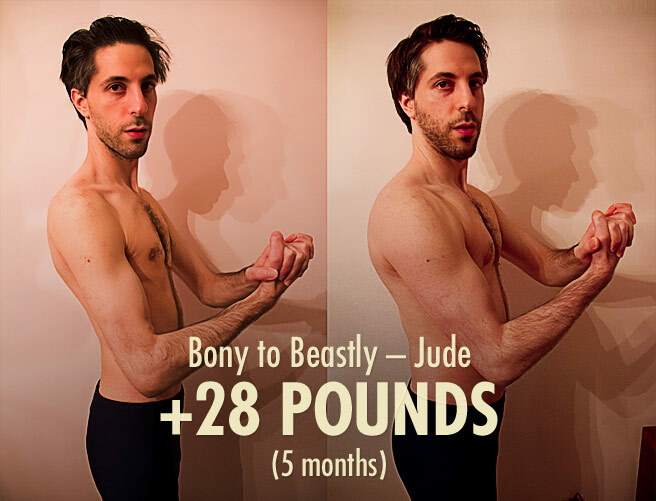 To add to what Jared said, Jared himself gained 33 pounds in 90 days (without drugs). The most I’ve gained in 90 days is a little over 20 pounds (also without drugs). 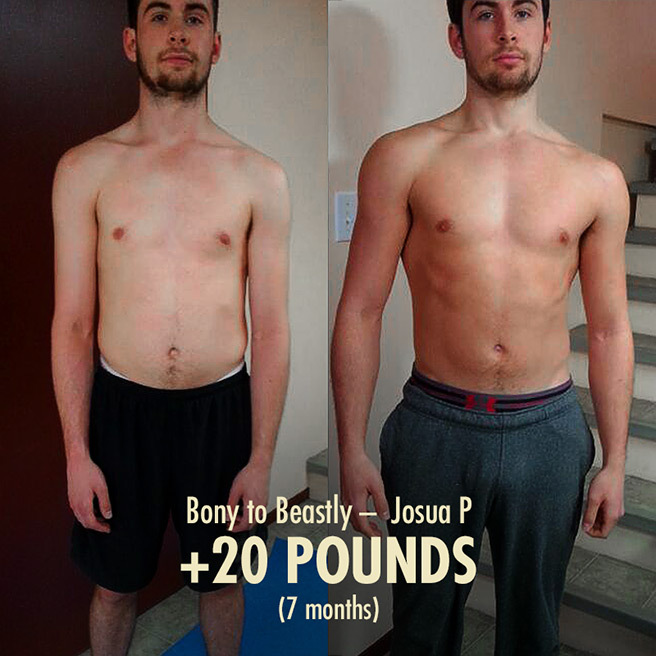 It’s not scientifically impossible to gain more than two pounds of muscle per month. 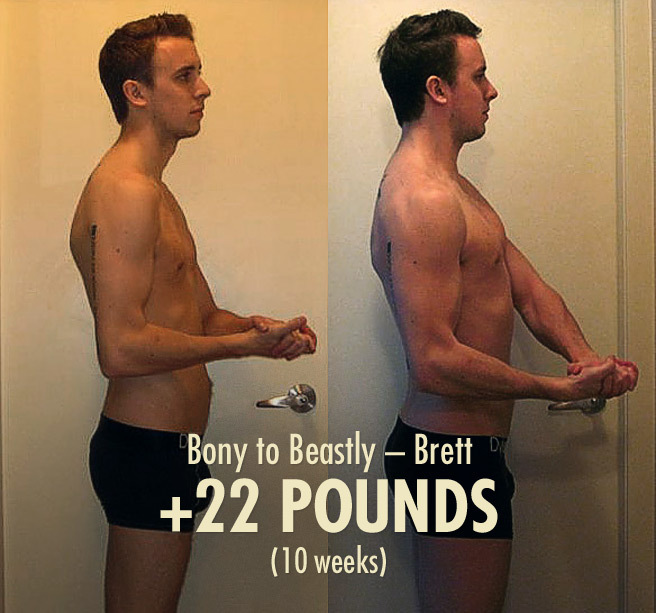 It’s not even impossible to gain more than two pounds of muscle per week. There have been numerous examples of this in the scientific literature. However, like Jared says, the situations are normally extraordinary. For example, someone who is underweight, or someone who is recovering lost muscle mass, someone who has never lifted weights before, someone who has remarkable genetics, or someone taking drugs. Moving beyond just gains in muscle mass (including glycogen, which is largely water), yeah, when people bulk up, they also tend to gain a variety of different kinds of weight: our muscles grow, we gain bone density, we gain some fat, our stomachs grow, etc. 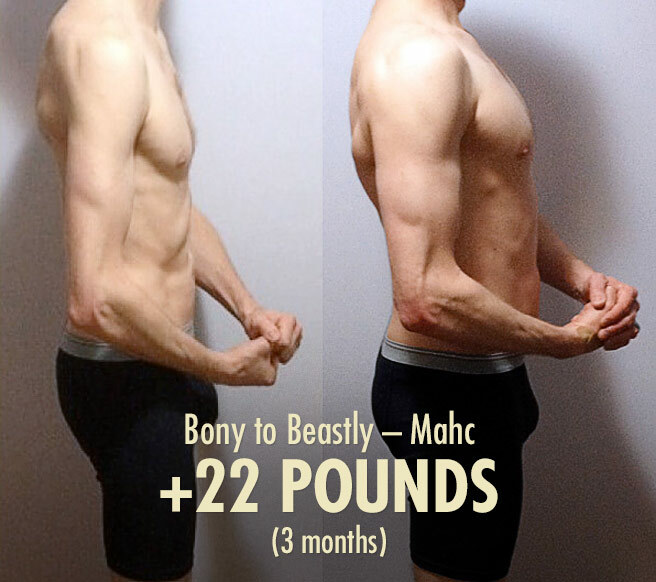 Even somebody who maintains the same body fat percentage while (say 12%) will gain some fat as they grow bigger (in this case 1.2 pounds of fat for every ten pounds they gain overall). As you get closer to your genetic muscular potential, though, yeah, gaining around two pounds of muscle per month is realistic for a while. At a certain point, though, even that will become too rapid. 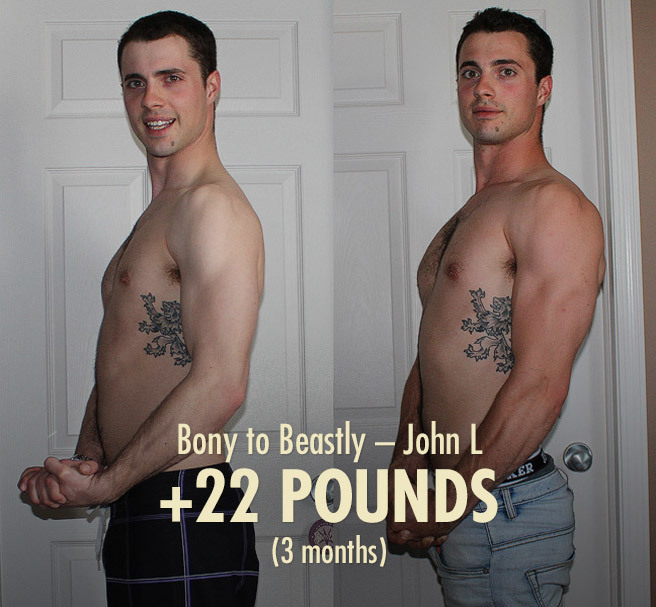 An advanced bodybuilder can’t gain 24 pounds of muscle in year. They’d be lucky to gain 1/10th of that. Thanks for the extremely informative, well-researched article. And it was free! You have helped a small man nurture his big dreams. When I work out my joints hurt. They make noises all the time, but when I work out it comes with pain. Elbows, knees if I squat, shoulder sometimes. One doctor told me that It was ligament laxity, but I don’t think so. They don’t have a super range, it’s not abnormal, they just do a loot of cracking noises and get inflamed and hurtful after even the lightst of the work outs. Did you ever heard anything of the sort with anyone trying to work out? I can’t diagnose you as I’m not a medical professional, nor can I see you, but I can share my own experience. I got into weightlifting due to tendonitis in both my arms, but I also had a bummed knee earlier from skateboarding as a teen (had surgery, etc.). Weightlifting and eating well helped to solve my tendonitis almost 100%. But one of the things I had also tried was supplementing with Type II Collagen since I had read it could help with tendons. I started taking it and noticed no improvements in my arms but suddenly my knees stopped hurting. It was something I had totally learned to ignore. Before I had taken the supplement, I had to be ultra-careful with my form, couldn’t squat very deep, the knee could go out past my toes, etc. Now it doesn’t hurt at all. Look up all the supplements to do with bone health on Examine.com and evaluate if any of these sounds like it could work with minimal risks. I hope the physio or some other solution can help you out, I know how much these types of aches and pains can affect life! Awesome article. Way to represent us skinny fucks! Shane, I just wanted to thank you for sharing this article and many more that you have written. I am a hard gainer eating 4000 calories a day and your articles answer so many of my questions on point so much. This was such an awesome find. I wish so badly that I had found it a year ago. I have been following strictly Michael Mathews BLS program and I have made great gains in the last year but I’m sure I could have done it faster with your tips. Moving forward, Thank you so much.